THE HEROESONLINE BLOG | HEROES POP SWAP :: THIS SATURDAY! HEROES POP SWAP :: THIS SATURDAY! 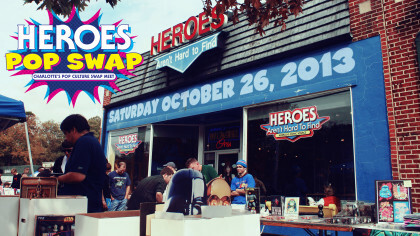 Heroes Pop Swap: Charlotte’s Pop Culture Swap Meet is happening this Saturday! Bring the whole family for great deals on collectibles both old and new! Pop Swap is also a great time to give your Halloween costume a test drive, we’d love to see it! We will have free comics for kids (under 12) in costume. This is a free event so please tell all your friends and we’ll see you at the store on Saturday!